We believe that our patients are the best judges of the quality and service of our dentistry in Port Chester, New York. Read what our patients are saying about us below. I was completely at ease during my appointment here. They went to great lengths to make sure I was completely relaxed and comfortable the entire time. The restrooms at this office were spotless. It smelled amazing in there and looked immaculate. It was nice to hear how much the staff respected them. It made me that much more confident that I was under the care of a professional. They have a very good professional reputation. I know that I'm under the care of an expert. I spend a little too much time in the waiting room. I've waited longer at other offices, but I was hoping to be seen sooner. It all started with our daughter Helene, in regard to the dental practice of Dr. Chi Fu. Our daughter spoke so highly of Dr. Fu, and eventually my wife and I experienced the same feelings for him. We are both seniors and have lived a lifetime in Port Chester. I would be safe to say, that our entire experience, from the dental personnel, office manager, technicians, hygienists and Dr. Fu has been one of a positive nature. The on hands manner, in which Dr. Fu gives, is above any other dentist we have dealt with. He truly shows a concern for our well being, and takes the time to explain everything. Our appointments are given in a reasonable time period, and that appears to us, as a sign of accommodations, that were not experienced with our previous dentist. We definitely recommend Dr. Fu and his staff for anyone who is seeking an excellent, reliable dental service. This is a letter of recommendation for my dentist, Dr. Fu, my dental hygienist, Barbara and all the medical staff in the office. My name is Maggie Worell and I have been a patient in this office for many years now. My first connection was with Barbara: she has been my hygienist for more than twenty years. When Barbara went to work for Dr. Fu I followed her to that office. It was one of the wiser decisions I have made with regard to my health care. My teeth have always been problematic. Barbara has been responsible for the healthy condition of my gums. She is a diligent hygienist. Her attention to detail goes way beyond the norm! You can tell she likes her job and it comes through in her performance. Dr. Fu is a skillful dentist. He is patient and thorough. He does not rush to a conclusion but rather with take his time and consider all the possibilities. He always tries to ease your anxiety. It is a big job when it comes to me and he is quite successful. Also the cosmetic work that he has done looks very natural. Dr. Fu is also one of the kindest dentists that I have known. Needless to say that at my age I have known a few and I can tell you that Dr. Fu really cares about his patients. In fact Dr. Fu's first task was to undo the poor dentistry of my former dentist. This involved root canal work gone bad and was quite complicated. He handled it in a professional and caring manner. He immediately gained my trust and it has never wavered since then. More than once I have had to make an emergency appointment and I have received incredible attention from all the office staff. Dr. Fu sets a high standard in the office and that kindness and caring shines through with all of the staff! Finally I no longer reside in the New York area. A dental appointment is a trip for me. Nevertheless I would not think of finding a new dentist. I know what good dentistry is and it is a time commitment I am willing to make. It is without reservation and with the utmost confidence that I would highly recommend to you the dental services of Dr. Chi Fu. A trip to the dentist office is made a pleasurable experience by having a dentist like Dr. Fu and the staff that he employs. Dr. Fu is knowledgeable in his field and a top notch dentist. His work is unparalleled. The staff is professional, courteous, and fTiendly. Do your teeth a favor and make an appointment to see Dr. Fu and his staff. Your smile will Thank You! Dear Dr. Fu and team, Thank you so much for the great job you did with my laminates and crowns. I have a new smile!! Everyone in your office has treated me with concern and kindness, and I am impressed by your desire to be sure everything is just right. Many people have commented on the change in my looks. They tell me that I should have done this years ago. I am inspired to go on with making over other areas in my body for a new beginning. They say that it is never too late! Dear Dr. Fu, I have been seeing you for over five years as my dentist and what a difference you and your staff have made in my life. Just walking into your office I feel at home with a wealth of greetings from you and the staff you work with. The technology in the office is all state-of-the-art as compared to the last dentist I worked with who still had charts that were handwritten. Your friendly personality and warm nature comes across through the everyday work you do and makes a difference in developing relationships with your patients. For many people going to the dentist is a scary experience; I have been blessed because going to your office is a pleasure and something I look forward to. Thank you for all of the great work you have done. My trust in you has enabled me to refer family, friends and co-workers to you to which speaks volumes of your practice. Keep up the excellent work you do ... it makes a difference in the lives of others. I love to smile and the work you and your staff have done makes me smile even more. Like many people, going to the dentist is not one of my favorite things! However, Dr. Chi Fu and his friendly office and dental assisting staff consistently make my visits a pleasant and relaxing experience. Dr. Fu is always patient, careful, and has excellent professional skills. I strongly recommend him without hesitation if you are in need of dental services. Having dental work performed in the past was always agonizing for me and quite frankly, I'd rather have had surgery than dental work! With that in mind, I just want to thank you for all the beautiful dental work you have done on my teeth since last August. I've had several old crowns removed and replaced because of receding gums, my teeth whitened, a root canal performed and 7 veneers done on my upper front teeth. All of this work has greatly improved the appearance of my teeth, which were crooked and discolored, I no longer get food caught between my teeth, and I love my new appearance. When I look in the mirror, I can't believe it's my smile. I am a true believer that your teeth can make you look a lot older than your actual years and my new smile makes me look a good 10 years younger than I actually am! I know it's important to keep your teeth healthy and in good shape because bad teeth can lead to gum disease and even heart problems. But when the word "dentist" was ever spoken in my presence, I would cringe and hope another tooth wouldn't break, a cavity become apparent, or a filling fall out. You have a terrific staff assisting you and it's a pleasure not to have to wait past my appointment time. I would highly recommend Chester Hill Dental to everyone. When I was referred to Dr. Fu's office, by my sister Kerry, for dental care, I was so happy that the staff was so friendly and laid back. Dr. Fu is the nicest dentist. After a tew visits, I asked him for a consultation for Invisalign. Since I was a child I've always hated my teeth. Dr. Fu explained the whole process of Invisalign. It really seemed very simple. I liked the fact that they were clear, removable and convenient. Now that the procedure is done I can't say enough how happy I am with the results. For the first time I'm not ashamed of my teeth. Thanks for everything, Dr. Fu; I'm actually proud of my smile now! I always felt nervous and uncomfortable visiting dentists until I met Dr. Fu. I have had many unpleasant experiences, hence my teeth were in dire need of the best dentist I could find. Dr. Fu was recommended to me just in time! I can't thank him enough. Also, my teeth are beautiful now. I can smile again! Missing teeth not only affect the appearance of your smile, they negatively impact the function of your entire mouth and, ultimately, your overall well-being. Natural-looking dentures and partials designed by Dr. Chi Fu Chester Hill Dentistry in Rye, NY, are excellent ways to restore your smile and improve your quality of life. Today’s dentures are not your grandparents’ dentures. And there is no need to think of dentures as a last resort. Dentures are a viable solution to repair your smile. Innovations in dental technology have improved the reality of living with dentures or partials to replace missing teeth. Durability, appearance, and functionality are the biggest worries patients have when it comes to dentures. Modern dentures – full or partial – are strong, look like natural teeth, and work properly so that you can feel confident about speaking, biting, chewing, and smiling. Complete dentures, or full dentures, are the traditional denture restoration, replacing entire arches of top or bottom teeth or both. The prosthetic is attached to a gum-colored base, customized to fit to each patient’s palette, and typically held in place with adhesive. This repair can feel odd at first. Over time, the soreness and increased saliva flow that are typical side effects of new dentures will subside and your jaw muscles and mouth tissues will adjust to the presence of the removable dentures. Partial dentures are an option for people who are missing several teeth but have healthy remaining teeth to use as a support for a partial designed to fill the gaps. 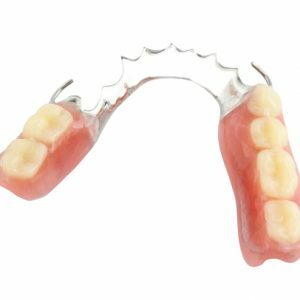 Attached with clasps, partial dentures are easily removed so they can be cleaned properly and daily. The point of partial dentures is not only to eliminate the hole in your smile, but to prevent your remaining natural teeth from shifting to fill the spaces in your mouth. Permanent dentures can be held in place by either dental implants or anchored with dental crowns. Dental implants are placed directly in the gum and jaw bone and have a prosthetic tooth attached to the top of the implant, creating a natural-looking and very strong tooth replacement solution. Patients appreciate the reliability, permanence, and easy upkeep of permanent dentures. Regardless of the reasons for your missing teeth – gum disease, accident, age, decay, or otherwise – if you are missing several teeth or entire arches of teeth, you already know how problematic it is to live with this reality. It’s difficult to eat, you can’t speak clearly, and your confidence takes a hit. Missing teeth make you constantly conscious of your appearance. You may only be able to focus on the fact that you’re missing important teeth – and this fixation will project onto everyone with whom you interact. Whether another person is looking at your broken-down smile or not, you’ll feel like they are. Living with dentures is far easier than living with missing teeth. Cleaning removable dentures nightly may seem like a pain, but you would floss and brush your permanent teeth anyway, right? Denture upkeep is just a different step in your oral health care regimen, not an additional step. Your Chester Hill dentist will provide detailed instructions for the at-home care of your dentures so that you feel confident about living with dentures. 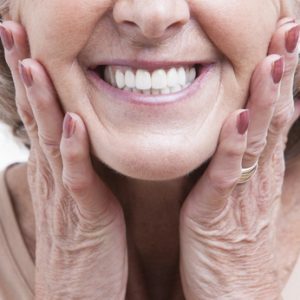 Taking care of this restoration is critical to maintaining the good condition of your dentures and, therefore, your oral health and appearance. Visiting your Westchester area dentist regularly to ensure that your dentures are fit and working properly is also an important element in your dental care. Getting replacement teeth for missing teeth does not take the place of oral health care. Plus, it’s essential for your dentist to keep an eye on your dentures – they are durable, strong, and will last for a long time, but dentures are not immortal. Over time, dentures will need to be refitted or replaced so that your teeth and smile remain completely functional and fabulous. Don’t allow an incomplete smile to jeopardize your oral health. Chester Hill Dentistry offers a variety of restorative dentistry solutions to replace missing teeth, from dentures and partials to dental implants to dental bridges. Consult with Dr. Fu to determine what customized procedure is best for restoring your smile to fine working order and appearance. Contact our office to schedule an appointment. We serve the residents of Rye, Westchester, Rye Brook, Port Chester, and surrounding areas, including Greenwich, CT.
Are you looking for a Rye NY Dentist? Visit Chester Hill Dentistry in Portchester, Westchester NY with Dr. Chi Fu today! Serving the areas of Port Chester NY, Rye Brook NY, Greenwich CT and beyond!